Koehler, 172, Oswego trains. One cent stamp & postmark: Oswego Oregon Mar 10 4 PM 1909. [addressed to and message]: Walter Waldorf Mulino Ore. Hello Wat. there is going to be a dance here Sat night hope you will be here I have not got time to write now. Will write later on. I will look for you Sat. night by by Durch. Description Sepia photo. Same as 151a - g, 1400, 1657, 2483, 2971, & 5672 although they may be cropped differently. Imprinted on front: depot Oswego Or. Numbers on engine and car: 1508, 2001. Lettering on car: Southe[rn]. 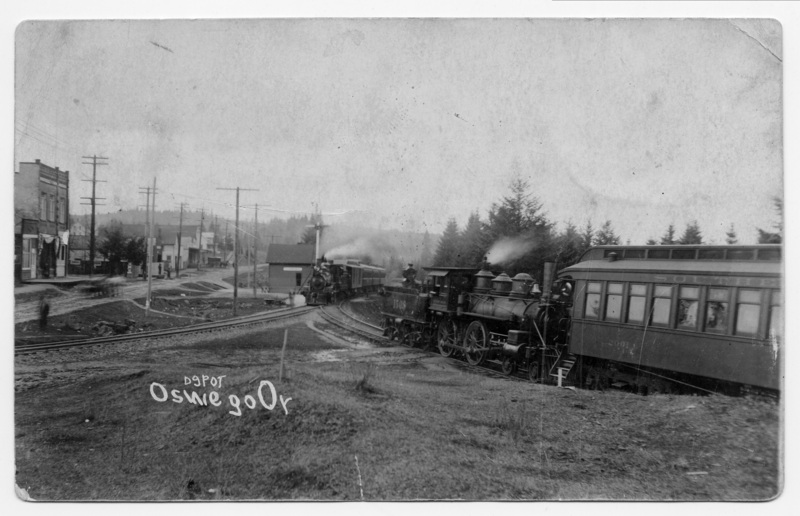 Transcription Koehler, 172, Oswego trains. One cent stamp & postmark: Oswego Oregon Mar 10 4 PM 1909. [addressed to and message]: Walter Waldorf Mulino Ore. Hello Wat. there is going to be a dance here Sat night hope you will be here I have not got time to write now. Will write later on. I will look for you Sat. night by by Durch. Physical Description H 3 1/2" x L 5 1/2"